Let others debate whether Santa Claus is white or not. There’s no debate that the definitive American Santa is political cartoonist Thomas Nast’s Merry Old Santa Claus (detail shown above) from the New Year’s Day 1881 edition of Harper's Weekly. If it looks a lot like the picture in your head from Clement Clarke Moore’s "The Night Before Christmas," you’re right—Nast borrowed heavily from 1823 poem and its “cheeks… like roses,” “nose like a cherry,” etc. But that wasn’t Nast’s first crack at depicting Old Saint Nick. Nast actually first drew Santa for the American public in 1863, during the midst of the American Civil War. In these sesquicentennial years of the War Between the States, it’s important to also remember the smaller sesquicentennials, such as this anniversary of the beginning of what we now “know” Santa to look like. Black or white, fat or thin—Santa and his Civil War roots say as much about the circumstances of his origins as about what he and the holiday mean today. 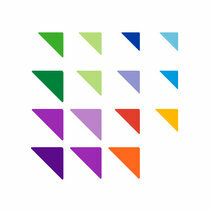 It’s truly amazing how Nast’s legacy as a visual artist lingers even today. His political cartoons exposing and mocking the exploits of the infamous Boss Tweed and his corrupt Tammany Hall have made both those names enduring go-to metaphors for political corruption. The Republicans’ elephant and the Democrats’ donkey both came from Nast’s pen and fertile imagination. As much as political parties and the very nature of campaigning change thanks to technology, Nast’s imagery clings to the DNA of American democracy. 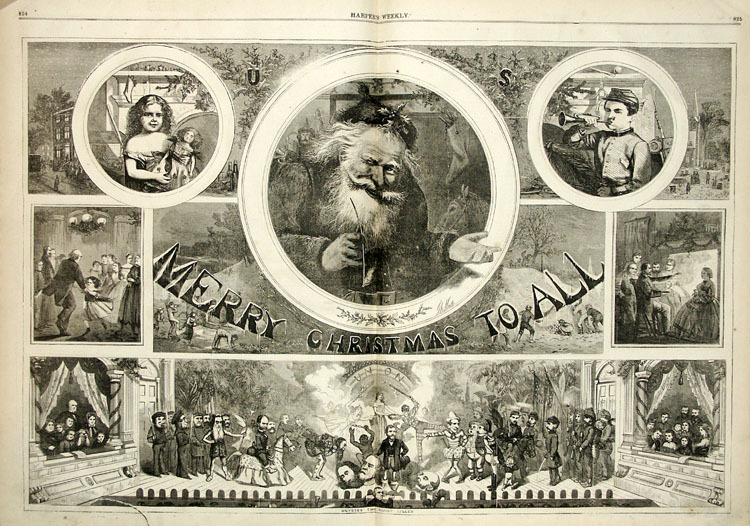 On the cover of the January 3, 1863 issue of Harper's Weekly, one of the most popular illustrated periodicals of the Civil War era, Nast showed Santa visiting Union troops and handing out gifts. (Click on the links to see the illustrations.) A star-spangled Santa (a patriotically permissible alteration to the standard Santa suit) sits atop a sleigh as two younger boys in uniform play with a Jack in the Box at the bottom of the cover. 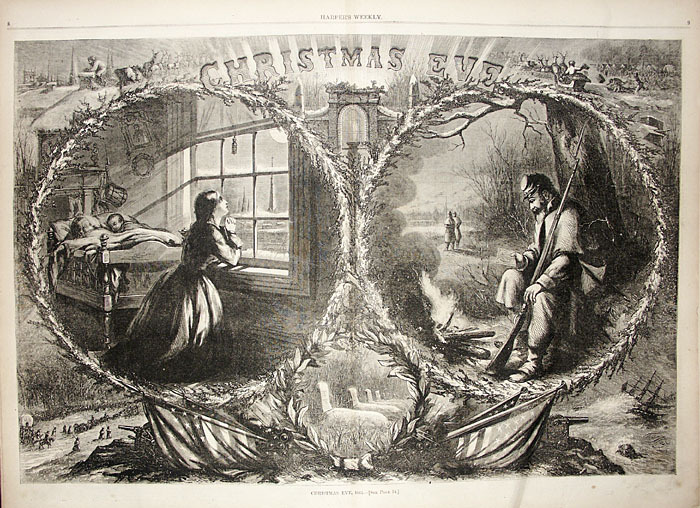 Inside that same issue, Nast showed a woman on Christmas Eve praying for her husband at the foot of their child’s bed in one porthole portrait as the companion porthole showed the soldier husband staring into a campfire and imagining the hearth of home. Above the two scenes, a tiny Santa climbs down a chimney in the upper left corner and later rides in his sleigh in the upper right corner. In 1864, Nast draws more hopeful and happy vignettes. In the leftmost image, titled “Eve,” we see Santa Claus weighed down by his sack of toys and smiling over children sleeping in their beds. In the center picture, titled “Furlough,” a soldier returns home for the holidays to the joy of his family. In the final scene on the right, marked “Morning,” the children open up their gifts to complete the story. If Nast allowed the sadness of the dragging conflict to infect his 1863 Santa pictures, he indulged in some hope and happiness for 1864. 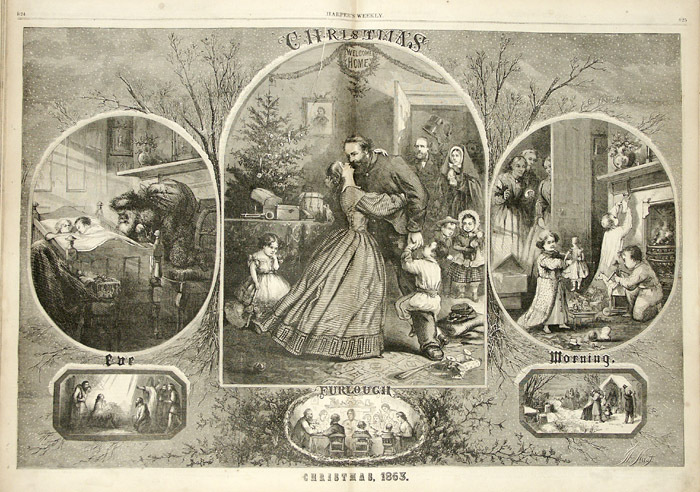 On December 31, 1864, Nast published another Christmas scene, but gave Santa the day off. Instead, a different bearded figure takes center stage—Abraham Lincoln. Surrounded by smaller Biblical scenes of forgiveness and reconciliation, Lincoln presides over the center scene, in which he extends a magnanimous arm to invite weary Confederate soldiers to join in “The Union Christmas Dinner.” Although the Union’s eventual victory seemed clear by that point, the South continued to drag out hostilities. Father Abraham plays the role of Father Christmas here to give the gift of forgiveness and peace to the war-torn country. Alas, it would take another four months for that gift to be accepted. Lincoln himself would meet his own end shortly after. 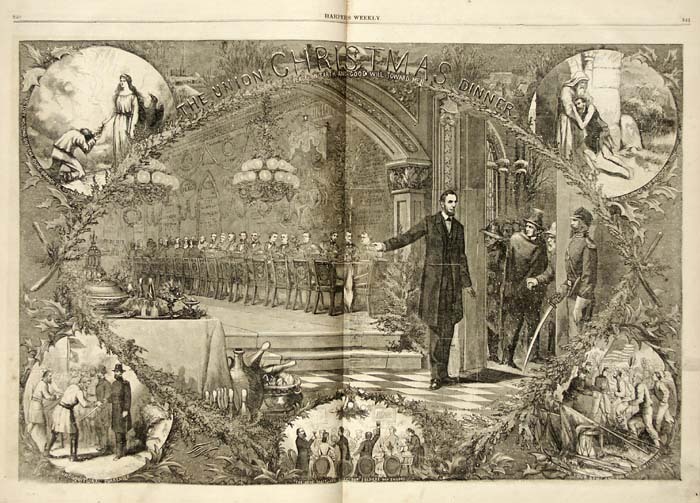 At the end of 1865, Nast presented his first post-war, post-Lincoln Santa scene. Santa reclaims his central position amidst scenes of holiday merriment—a return to normalcy after the surreal life under war. However, at the foot of the composition, Nast shows a stage of sorts peopled by uniformed soldiers. At the center of the scene play recognizable faces of the war, such as Grant, Sherman, and Lee—some existing only as disembodied heads. It’s as if Nast wants us to see Santa and the hope and joy he brings as the true reality and the bloodshed and grief of war as merely a theatrical fantasy easily forgotten at the bottom of a page. Nast indulges in wishful thinking, of course, but what a wonderful wish. Christmas always holds a strange paradox for me in that it is when we celebrate joy and life but can’t help but ponder their opposites—sadness and death. Gathering together for the holidays makes the empty places at the table seem so much more present. I’m a sucker for traditions, so I annually surprise myself with the Faulkner-esque realization that the past isn’t dead, and it isn’t even past. Our present’s made of our past despite our best efforts to press on into the future, just as our Santas and our politicians will always be Nash’s regardless of Twitter or Politico. In this year of continued and deepening economic inequality coupled with stagnant economic mobility, finding happiness under the tree isn’t likely for far too many people. But when we look to Nast’s Santa Claus, that figure of generosity and joy, we should remember that his roots reach into the darkest days of our nation, the time when he was needed most. The greatest gift that Santa has always held in his bag for America is the gift of hope for better days ahead.